One of the great mysteries still unfolding is Russia's involvement in the 2016 presidential election, specifically their efforts to help President Donald Trump's campaign. Greg Miller, a Pulitzer Prize-winning national security correspondent for the Washington Post, has revealed the pre- and post-election drama of Russian President Vladimir Putin’s secret operation and its catastrophic impact that has spawned numerous political, legal and diplomatic crises in the new book, The Apprentice: Trump, Russia, and the Subversion of American Democracy. With unprecedented detail and access, drawing on the prize-winning reporting of the entire Post national security team and their hundreds of interviews, Miller investigates the roots of the Kremlin’s covert attempt to help Donald Trump win the presidency. There is also thorough analysis of Robert Mueller’s ensuing investigation of the president and those close to him, and Miller outs it all together to craft a gripping narrative that stretches from the Kremlin to the West Wing. In a vivid and gripping narrative, Miller looks at how the Russians carried out their systematic and highly effective plan to hack the Democratic National Committee, undermine American democracy, hurt Democratic nominee Hillary Clinton and help Trump. There is a wealth of new information about how Russia planned to use social media, including Twitter and Facebook, to spread disinformation and sow discord among American voters. The bizarre attempt by Jared Kushner, Trump's son-in-law, to create a secret backchannel to Moscow using Russian diplomatic facilities, as well as Kushner's possible efforts to secure large loans from a Russian bank widely regarded as "Putin's slush fund." The mysterious Trump Tower meeting of June 9, 2016, involving Donald Trump, Jr., Jared Kushner, Paul Manafort, and Russians with close ties to the Kremlin. "Trump's admiration for Putin was grounded in envy of the way he ruled," Miller writes. "Putin faced none of the annoyances that Trump complained about most, including the recalcitrant press, haranguing political opposition, and the disloyal ranks of the 'deep state' Putin's authority was, or at least appeared to be, absolute. He could spread falsehoods at will, order investigations of adversaries, and never worry about sagging poll numbers (because elections were reliably rigged). "Most important, Putin was immune to the kind of investigations that were beginning to encircle and enrage Trump. The American president couldn't replicate the arrangement, but Trump seemed to anticipate something approximating it once he had installed subordinates he could count on in key positions. The emerging tensions between Trump and Comey - the gap between 'loyalty' and 'honest loyalty' - reflected a conflicting vision of government and accountability that could never be reconciled. Which would prevail?" Miller contends that Trump, who gained national fame with the TV show "The Apprentice," is not only that in the role of President, but in his servility toward Putin. There were many White House battles between President Trump and his own advisers on Russia. Miller describes efforts by the FBI to keep Trump from giving back two Russian compounds that had been seized to punish Moscow for interfering in the election. There are previously unreported details about Trump's impulse to sell the Russian compounds as if they were Trump property developments. When shown three-dimensional models of the compound by the FBI, Trump asked, "Should we sell this off and keep the money?" Trump aides manipulated him into backing new sanctions after Russia poisoned two people in Europe, only to have the president accuse his own aides of lying to him. Trump treated the top Russia official in the White House, Fiona Hill, in an insulting manner, assuming she was part of his clerical staff. Trump had a volcanic reaction to learning that the U.S. was imposing greater sanctions than any country in Europe over Russia's poisoning of two people in England. Miller reveals extraordinary scenes involving courageous sources coming forward, duplicitous attempts by the White House to derail stories, and warnings that there was surveillance on Post reporters. The Washington Post received an anonymous letter describing specifics about the December 2016 meeting at Trump Tower between Kushner, Flynn, and Russian diplomat Sergey Kislyak, in which Kushner suggested a back channel of communication to the Kremlin. Miller ambushed Kislyak at a science conference and gained firsthand on-the-record confirmation that he and Flynn had communicated more extensively than the White House claimed. There were also clandestine meetings with sources who confirmed that Flynn had lied about his conversations with Russia, and the gripping encounter between a Post reporter and Flynn in his White House office when his lie begins to unravel. Soon after Trump took office, on January 26 and 27, 2017, Acting Attorney General Sally Yates meets with White House counsel Don McGahn at the White House to warn him that Flynn is now exposed to Russian blackmail because of his lies about his contacts with Kislyak. Also on January 27, Trump invited FBI Director James Comey to the White House for dinner. Trump implicitly reminds Comey that his job is not secure and tells him "I need loyalty." "'Do you have a FISA order on Mike Flynn?' he asked. "Comey explained that was the kind of question that should go through the Justice Department, but answered anyway, saying no (the warrant was for surveillance of Kislyak). Priebus then poposed they walk to the Oval Office. "Days later, on February 14, a dozen senior officials assembled in the Oval Office for a counterterrorism briefing with Trump. Unlike other presidents, who tended to take a seat near the fireplace and gather advisers around, Trump stayed parked behind his imposing desk. Th lead briefer, Nick Rasmussen, director of the National Counterterrorism Center, sat with his knees pressed against the wood. Next to him was Comey, back in the Oval Office for the second time in less than a week. Absent was Flynn, who that day was surrendering his badges and phones, a final severing of his government service. "Trump seemed disengaged during the session, then ended the meeting with a loud 'Thanks, everybody.' As he stood up to walk people out, he motioned for the FBI chief to stay behind, saying, 'I just want to talk to Jim.' Attorney General Jeff Sessions seemed to hesitate, hanging on as others filed out, but Trump moved him toward the exit. Kushner lingered as well. approaching Comey and making comments about the Clinton email investigation. It was as if both Sessions and Kushner sensed that Trump was about to do something regrettable but didn't know how to prevent it. 'Okay, Jared, thank you,' Trump said, ushering his son-in-law out. "As the door by the grandfather clock in the Oval Office closed, Trump turned to Comey. 'I want to talk about Mike Flynn,' he said. The president declared that his national security adviser 'hadn't don't anything wrong' in his call with the Russian ambassador but had to be fired because he misled the vice president. Trump alluded to other concerns about Flynn but didn't elaborate. "Trump tried to argue that the more serious problem deserving the FBI director's attention was how Flynn's interactions with Kislyak had surfaced in the press. 'It is really about the leaks,' he said. He voiced irritation with a February 2 story in the Post about his belligerent calls with Australian prime minister Malcolm Turnbull and Mexican president Enrique Pena Nieto, pointing to 'this beautiful phone' on his desk and asking why the words he said into that secure device had so quickly spilled out before the public. Comey finally found an area of agreement with the president, saying he was 'eager to find leakers' and that there was value in 'putting a head on a pike as a message.' Trump seemed to relish the tough talk, and said that he favored putting reporters in jail. 'They spend a couple days in jail, make a new friend, and they are ready to talk.' (Reading this many months later, I cringed when I saw the references to Trump's calls and realized that I was the reporter they were discussing.)" On March 2, 2017, Sessions recused himself from the Russia investigation because of his own involvement in the Trump campaign and his own misstatements to Congress about his communications with Russian officials. Rod Rosenstein is confirmed as Deputy Attorney General on April 25, 2017, and he assumes control of the Russia investigation. Just over a week later, on May 3, 2017, Comey vigorously defended his handling of the Clinton email investigation in an appearance before the Senate Judiciary Committee. His statement that it made him 'mildly nauseous' to think that his handling of the Clinton email probe might have cost Clinton the election incenses President Trump. Six days later, on May 9, Trump fired Comey, claiming that he is relying on the judgment of the Justice Department, and particularly a long memo from Rosenstein, that Comey had badly mishandled the Clinton email investigation. The very next day, Trump hosted Kislyak and Russian Foreign Minister Sergey Lavrov at a hastily arranged meeting in the Oval Office, where he called Comey a 'nut job' and says that firing the FBI chief had eased pressure on his relationship with Russia. Trump also disclosed highly classified information about Israel's intelligence operations in the Middle East, infuriating intelligence officials in that country, as well as in the United States. Miller covers all that has unfolded since then, up until when, on the same day, August 21, 2018, Trump's former campaign manager Paul Manafort was convicted by a federal jury in Virginia on eight felony charges, and his personal lawyer Michael Cohen plead guilty to eight felony counts, including bank, tax, and campaign finance violations. The investigation of Special Counsel Robert Mueller is moving apace and there are still revelations every day about how Russia not only influenced the 2016 election, but is planning on interfering in the upcoming midterm elections. 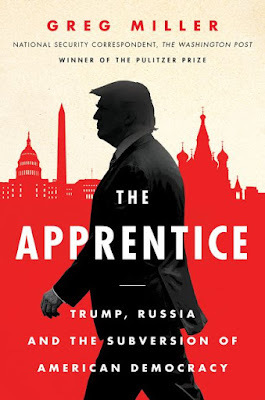 The Apprentice is the definitive account of the dealings between President Trump and Russia, told from a reporter who is on the front lines.